Multi-User Accounts allow you to create sub-account users ('seats') with different 'roles' for people in your organization who need to upload and manage videos. Account Owner: This is the person who created the account. They have the rights to add and remove users from the account, take ownership of the account's finance details, and decide who else can access these. Editors: Editors have access to all videos, settings, and playlists. Additional admin or finance rights can be assigned, and will be displayed to the right of their personal information. Users: Users are able to upload videos and manage their settings. They won't be able to change the settings of videos uploaded by other account users, but they do have control over their own uploads. Uploaders: Uploaders can only add videos to the account. Uploaded the wrong video? Don't worry, they can still delete it as long as it's no more than two hours after the video has finished encoding. Viewers: Viewers have access to the vzaar account to view videos only. They do not have access to, and therefore can not change, any account settings. As an account owner, you have the ability to give your users additional account privileges. 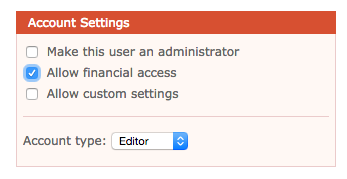 Currently, the below privileges can only be applied to users with the role of "Editor" or "User". Administrator: Selecting this option will give the user the rights to add and remove other users from the account, take ownership of the account's financial details, and decide who else can access these privileges. A user with this ability cannot give other users financial access. Financial Access: Selecting this option will give the user access to the account's financial details, including upgrading plans and changing billing details. Custom Settings: Selecting this option will give the user the ability to configure custom settings which differ from the account owner's settings. If you leave this unchecked, the user will inherit all settings from the owner account. Additional users can be purchased by contacting our Sales Department. 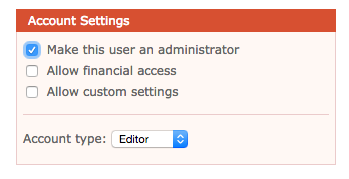 Note that your user allocation includes the account owner.